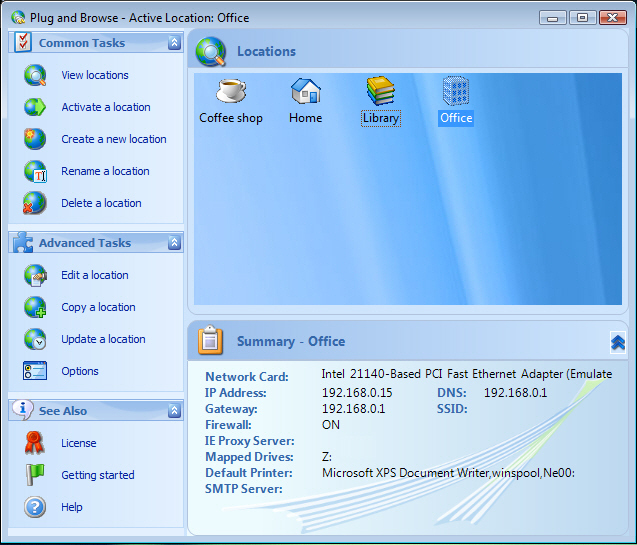 Plug and Browse is a netswitcher for notebook users who need to access the internet or a LAN from different locations. Create different network profiles and switch between network settings. The Plug and Browse netswitcher captures and restores all TCP/IP network settings, XP SP2 firewall settings, wireless security settings (Wifi), Internet Explorer, Netscape and Firefox proxy settings, and more. ...... Plug and Browse features an Automatic switching mode that can automatically switch network settings without any user input. Support Wireless protocols WPA, WPA2, WPA-PSK. Plug and Browse engine now runs as a Windows Service. This removes the requirement that users needed to have administrative privileges to activate a location. Options stored in an XML file instead of the registry. This simplifies deployment of default options to multiple computers in an Enterprise. Note that profiles were already stored in XML files. Support for switching the Outlook Express Default E-mail Account. Put your Web site on a diskette or CD! Automated TABBED browser; Multiple Web Pages with web page previews. Automated Browser tool to search for topics and browse them automatically. BrowserStar is your personal browser expert for Internet Explorer! Qweas is providing links to Plug and Browse 6.1 as a courtesy, and makes no representations regarding Plug and Browse or any other applications or any information related thereto. Any questions, complaints or claims regarding this application Plug and Browse 6.1 must be directed to the appropriate software vendor. You may click the publisher link of Plug and Browse on the top of this page to get more details about the vendor.